A 17th-magnitude dwarf star in Leo ly distant has the lowest metallicity of any star yet discovered. Stars with very low metallicity are designated as extremely metal-poor (EMP). SDSS J102915+172927 (aka UCAC3 215-112497, UCAC4 538-051259, Gaia DR2 3890626773968983296, or just J1029+1729 for short) was identified by Elisabetta Caffau and her team in 2011 to have a global metallicity of Z ≤ 6.9 × 10-7 which means that the star is 99.999931% hydrogen and helium. Looking at this another way, the global metallicity of our Sun is 0.0134 (98.66% hydrogen and helium), so Caffau’s Star has only about 1/19,000th the abundance of elements heavier than helium in comparison to the Sun. Metallicity is usually expressed as the abundance of iron relative to hydrogen. It is a logarithmic scale. [Fe/H] = 0.0 for the Sun; positive numbers mean iron is more abundant and negative numbers mean iron is less abundant than in the Sun. And so on. Caffau’s Star has an iron abundance [Fe/H] = -5.0, or 1/100,000th that of the Sun. Caffau’s Star is the only EMP star with [Fe/H] < -4.5 thus far detected that is not a carbon-enhanced metal-poor star (CEMP). In fact, Caffau’s Star has no detectable carbon! Nor nitrogen. Nor lithium. Caffau’s Star is probably almost as old as our Milky Way galaxy. In order to have survived for 13 Gyr, its mass cannot be any larger than 0.8 M☉. At a school board meeting in November 2017, concerns were raised about inadequate lighting for evening school events, so the Dodgeville School District directed Alliant Energy to install some additional lights. The lighting was installed during a warm spell in January 2018, and the photographs you see below were taken during the afternoon and evening of June 17, 2018. Rather than being used only when school events are taking place in the evening, these terrible lights are on dusk-to-dawn 365 nights a year. They are too bright, poorly directed, poorly shielded, and the glare they cause on W. Chapel St. and N. Johnson St. could pose a safety concern for pedestrians not being seen by drivers experiencing disability glare. I can imagine that adjacent neighbors are not too happy with the light trespass into their yards and residences, either. This is a perfect example of poor lighting design and unintended consequences. How could it be done better? Look for the solution below the following series of photos documenting the problem. Bleacher path looking towards W. Chapel St.
Bleacher path floodlight lighting up the disc golf course. Also note how much brighter the illumination is from the newly-installed blue-white LED streetlight as compared with the orangish light from the older high pressure sodium (HPS) luminaire. Early in the morning of Tuesday, May 29, 2018, I was fortunate enough to record a 3.2 second occultation of the 12.6 magnitude star UCAC4 359-140328 in Sagittarius by the unnamed asteroid 29769, originally given the provisional designation 1999 CE28. Not only is this the first time this asteroid has been observed to pass in front of a star, it is the smallest asteroid I have ever observed passing in front of a star. At an estimated diameter of 14.7 miles, had I been located just 7.4 miles either side of the centerline of the shadow path, I would have missed this event altogether! This is also the first positive event I’ve recorded for an (as yet) unnamed asteroid, and the first positive event I’ve recorded for an asteroid having more than a four-digit number (29769). As you can see in the map above, the predicted shadow path was quite a ways northwest of my location. Even though I used the Gaia DR2 position for UCAC4 359-140328 for the path prediction, the existing orbital elements for asteroid 29769 did not yield a correspondingly accurate position for the asteroid. Though a single chord across an asteroid does not give us any definitive information about its overall size and shape, it does give us a very accurate astrometric position that will be used to improve the orbital elements for this asteroid. As we can see above, the actual position of the asteroid at the time of the event was 0.0079 seconds of time east and 0.038 seconds of arc north of its predicted position. This observation will provide a high quality astrometric data point for the asteroid that will be used to improve its orbit. Gratifying! As of this writing, there are 523,584 minor planets that have sufficiently well enough determined orbits to have received a number. Of these, only 21,348 have received names (4.1%). So, I guess you could say there is quite a backlog of numbered asteroids awaiting to receive names. The IAU should consider naming some minor planets after the most productive asteroid occultation observers around the world. There aren’t very many of us, and this would certainly be an encouragement to new and existing observers. The Earth orbits the Sun once every 365.256363 (mean solar) days relative to the distant stars. 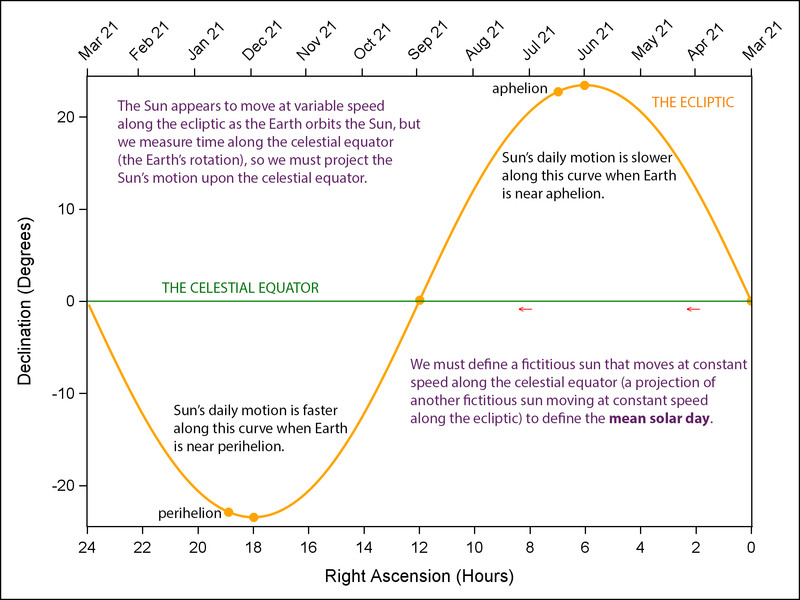 The Earth’s orbital speed ranges from 18.2 miles per second at aphelion, around July 4th, to 18.8 miles per second at perihelion, around January 3rd. In units we’re perhaps more familiar with, that’s 65,518 mph at aphelion and 67,741 mph at perihelion. That’s a difference of 2,223 miles per hour! As we are on a spinning globe, the direction towards which the Earth is orbiting is different at different times of the day. When the Sun crosses the celestial meridian, due south, at its highest point in the sky around noon (1:00 p.m. daylight time), the Earth is orbiting towards your right (west) as you are facing south. 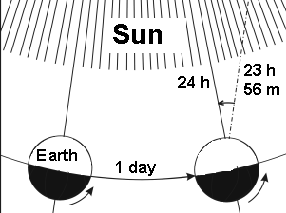 Since the Earth is orbiting towards the west, the Sun appears to move towards the east, relative to the background stars—if we could see them during the day. Since there are 360° in a circle and the Earth orbits the Sun in 365.256363 days (therefore the Sun appears to go around the Earth once every 365.256363 days relative to the background stars), the Sun’s average angular velocity eastward relative to the background stars is 360°/365.256363 days = 0.9856° per day. The constellations through which the Sun moves are called the zodiacal constellations, and historically the zodiac contained 12 constellations, the same number as the number of months in a year. But Belgian astronomer Eugène Delporte (1882-1955) drew up the 88 constellation boundaries we use today, approved by the IAU in 1930, so now the Sun spends a few days each year in the non-zodiacal constellation Ophiuchus, the Serpent Bearer. Furthermore, because the Earth’s axis is precessing, the calendar dates during which the Sun is in a particular zodiacal constellation is gradually getting later. Astrologically, each zodiacal constellation has a width of 30° (360° / 12 constellations = 30° per constellation). But, of course, the constellations are different sizes and shapes, so astronomically the number of days the Sun spends in each constellation varies. Here is the situation at present. The apparent path the Sun takes across the sky relative to the background stars through these 13 constellations is called the ecliptic. A little contemplation, aided perhaps by a drawing, will convince you that the ecliptic is also the plane of the Earth’s orbit around the Sun. The Moon never strays very far from the ecliptic in our sky, since its orbital plane around the Earth is inclined at a modest angle of 5.16° relative to the Earth’s orbital plane around the Sun. But, relative to the Earth’s equatorial plane, the inclination of the Moon’s orbit varies between 18.28° and 28.60° over 18.6 years as the line of intersection between the Moon’s orbital plane and the ecliptic plane precesses westward along the ecliptic due to the gravitational tug of war the Earth and the Sun exert on the Moon as it moves through space. This steep inclination to the equatorial plane is very unusual for such a large moon. In fact, all four satellites in our solar system that are larger than our Moon (Ganymede, Titan, Callisto, and Io) and the one that is slightly smaller (Europa) all orbit in a plane that is inclined less than 1/2° from the equatorial plane of their host planet (Jupiter and Saturn). Since the Moon is never farther than 5.16° from the ecliptic, its apparent motion through our sky as it orbits the Earth mimics that of the Sun, only the Moon’s angular speed is over 13 times faster, completing its circuit of the sky every 27.321662 days, relative to the distant stars. Thus the Moon moves a little over 13° eastward every day, or about 1/2° per hour. Since the angular diameter of the Moon is also about 1/2°, we can easily remember that the Moon moves its own diameter eastward relative to the stars every hour. Of course, superimposed on this motion is the 27-times-faster-yet motion of the Moon and stars westward as the Earth rotates towards the east. Now, take a look at the following table and see how the Moon’s motion mimics that of the Sun throughout the month, and throughout the year. So, if you aren’t already doing so, take note of how the Moon moves across the sky at different phases and times of the year. For example, notice how the full moon (nearest the summer solstice) on June 27/28 rides low in the south across the sky. You’ll note the entry for the “Jun 21” row and “Full” column is “Low”. And, the Sun entry for that date is “High”. See, it works!